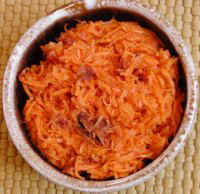 Wash and peel the carrots, and shred the carrots with a hand shredder or food processor, and place the carrots in a mixing bowl. 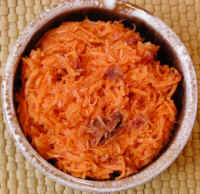 If you are using a food processor, the sun dried tomatoes may be shredded with the carrots; otherwise, cut them into small pieces, and add to the carrots in the mixing bowl. Add the lemon juice and a pinch of stevia extract to sweeten it. Then add some hot sauce and mix well. Taste it and adjust the amount of stevia and hot sauce as desired, and mix again. Cover and store in the refrigerator for at least an hour before serving to blend the flavors. Spicy carrots can be served with tossed salads, with rice, with beans, and in sandwiches.